First off this has one of the most annoying names of any root beer I know. The company’s name is Maine Root, which will work well with any flavor other than root beer. While one could just chalk this up to an oversight on their part, Root Beer was the first flavor they offered. Clearly, with their attention on all natural, organic, free trade, and free-range (I’ll get to that later), they just couldn’t be bothered by not making their root beer redundant. It’s a forgivable offense, but will probably always keep them in the top 5 annoying root beer names (coming soon). Secondly, they have the amusing gimmick of Free-range Root Beer. That calls for all natural root beers that live (and are perhaps captured) in the wild. One of their stated goals is to fight corporate root beer, which I’ve seen before from that Flathead Lake Monster swill, but these people have a much better strategy. The Body is crisp and well balanced. It is creamy with wintergreen surfacing after the initial contact. The Head is full and frothy. It lingers. It is less than the epic Head of a Henry’s, but sufficient for the most adamant connoisseur. There isn’t really much Bite. Though I like it smooth, some spices could improve it a bit. The Aftertaste is a creamy vanilla with hints of wintergreen. This is a very delicious and well crafted brew. Overall it has all of the right flavors in the right proportions. It is very clean and crisp on account of the cane sugar and no preservatives. The lack of preservatives is wonderful as the slight soapiness or fruitiness that accompanies sodium benzoate or citric acid is gone, so all of the focus is on the wonderful mix of root beer goodness. They may be on to something with that whole Free-range business. I must say that this is the best all natural root beer I’ve had so far. The only drawback is the almost complete lack of bite and that something extra, like honey or cinnamon, to really seal the deal, however, I am still proud to give this root beer my Seal of Approval. See how it rates against other root beers. This is my favorite root beer. Ice cold, and delicious. Your taste review nailed it imo. Thanks. I’m glad you like my review. This root beer is so bad. I’m really shocked it received a seal of approval. The only way to describe the flavor is ‘industrial.’ it tasted like it spent too much time sitting in the janitors closet and some caustic bleach fumes got through the glass bottle. What exactly are you tasting here? It is tangy and funky in all the wrong ways. 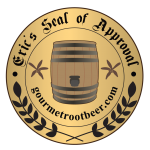 I have followed your top rated root beers to guide my buying choices. But this one was way off. How can Virgils be rated lower than this clorox tasting root beer. I know you can’t please everyone, and flavor is subjective etc. But this one is so blatantly weird. Anyway thanks for your website and your work.